Does your New Year resolution include exercise? I know it’s on the top of the list for both me and Kip! Every morning, Kip likes to sleep in while I wake up and bustle around. After a while he climbs out of bed and does his morning stretches! 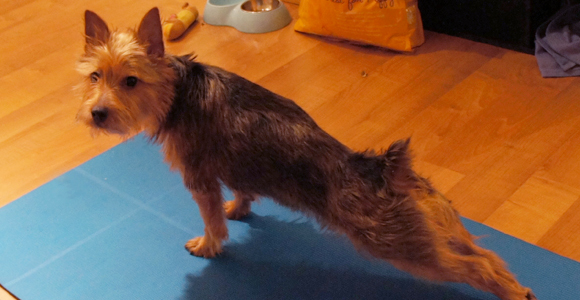 First he does the downward dog, and then he likes to lean forward and stretch out his hind legs. 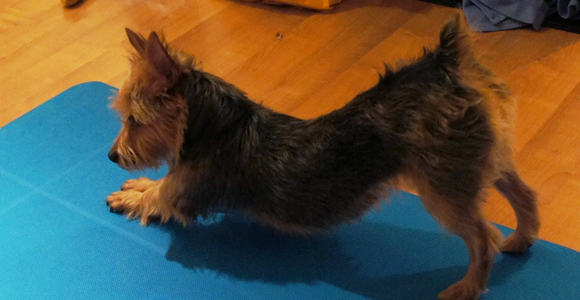 I thought it was funny that I caught him stretching out on my yoga mat. How cute is that? While I was looking back at my 2011 photos, I discovered a picture I had taken at the zoo. 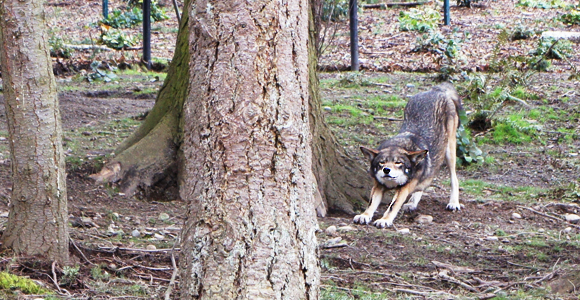 I saw this wolf stretching downward dog! From time to time, Kip likes to hunch up his back like a cat when he does his stretches. Is that just Kip or do other dogs stretch like that too?